When ricocheting a solution that involves analytics, the mainframe might not be the first platform that comes to mind. However, the IBM® System z® group has developed some innovative solutions that include the well-respected mainframe benefits. 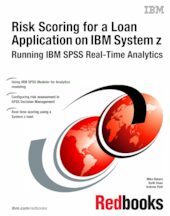 This book describes a workshop that demonstrates the use of real-time advanced analytics for enhancing core banking decisions using a loan origination example. The workshop is a live hands-on experience of the entire process from analytics modeling to deployment of real-time scoring services for use on IBM z/OS®. In this IBM Redbooks® publication, we include a facilitator guide chapter as well as a participant guide chapter. The facilitator guide includes information about the preparation, such as the needed material, resources, and steps to set up and run this workshop. The participant guide shows step-by-step the tasks for a successful learning experience. The goal of the first hands-on exercise is to learn how to use IBM SPSS® Modeler for Analytics modeling. This provides the basis for the next exercise "Configuring risk assessment in SPSS Decision Management". In the third exercise, the participant experiences how real-time scoring can be implemented on a System z. This publication is written for consultants, IT architects, and IT administrators who want to become familiar with SPSS and analytics solutions on the System z.